Basketball Shape Address Number Sign - - personalized address number plaque is the approximate size of a traditional standard basketball. Wall mount. Made in USA. 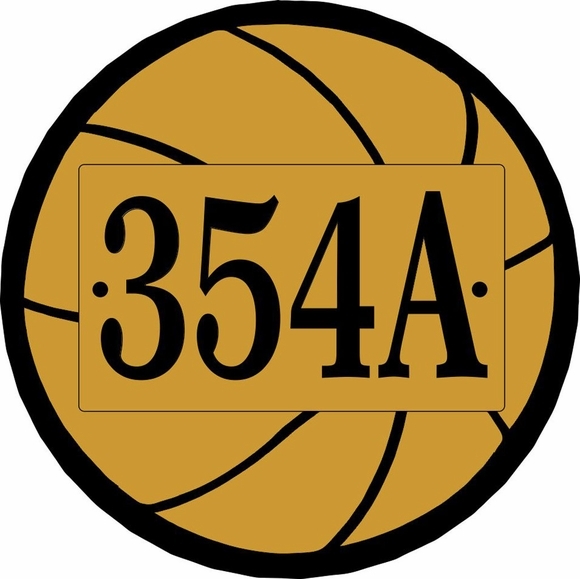 Address plaque in the familiar shape of a basket ball is perfect for all hoops fans. Customized with the address you specify. Address line holds up to four (4) 3" characters. Click top link in Related Products for a Basketball Shape address sign that holds one or two larger characters. Made from sturdy and UV-stabilized laminated non rusting acrylic with engraved personalization. Characters and border are permanently engraved into the sign during the production process, not painted or printed on. Comes with two 3/16" diameter fastener holes and stainless mounting screws for wall mount or fence post mounting. Colors: brushed gold with black characters (shown in large image) or brushed stainless with black characters (see small color chart). Dimensions: 10" diameter x 1/8". Comfort House exclusive laminated acrylic basket ball shape house number sign. Crafted in the USA by skilled artisans to assure the highest quality. Basketball not big enough to hold all the characters in your address or name? No problem. We can enlarge this sign up to 23.5" in diameter. Please contact customer service with your specifications for a quotation (customerservice@comforthouse.com).